“Under Dr Jakab’s leadership, Europe has repositioned key topics on the global health agenda, such as migration and health, child abuse and maltreatment, mental health, men’s health, women’s health, evidence-based focus on equity, a life-course approach to health, and of course primary health care and people-centred health systems. In this regard, I would like to thank her for her determination to establish the WHO European Centre for Primary Health Care hosted by our university,” said Professor Talgat Nurgozhin, Rector of the Kazakh National Medical University in Almaty, Kazakhstan. 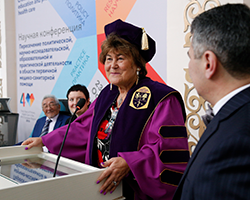 Dr Zsuzsanna Jakab, WHO Regional Director for Europe was presented with an honorary professorship by the Kazakh National Medical University, on 23 October 2018, during the scientific conference on primary health care held in Almaty on 23–24 October. WHO/Europe established a centre of excellence on primary health care in Almaty in 2016. Its work focuses on excellence in the design, organization and management of primary health care, integrated services, quality-of-care governance, and performance of services. The Centre is hosted by the Kazakh National Medical University and funded by the Government of Kazakhstan. The scientific conference, convened before the Global Conference on Primary Health Care, brought together the scientific community, civil society and primary health care professionals who are actively leading primary health care transformations in their communities. It focused on exploring the linkages between 4 often parallel, yet interlinked areas of work: policy, research, education and practice. Reflecting on how primary health care is adapting to respond to changing contexts, such as the burden of noncommunicable diseases, Dr Jakab commented, “The model of the single physician and nurse duo working in isolation is becoming a thing of the past; they cannot cope with these new expectations. The future is larger multidisciplinary primary care teams with access to information and powerful analytical tools for sophisticated population health management”.